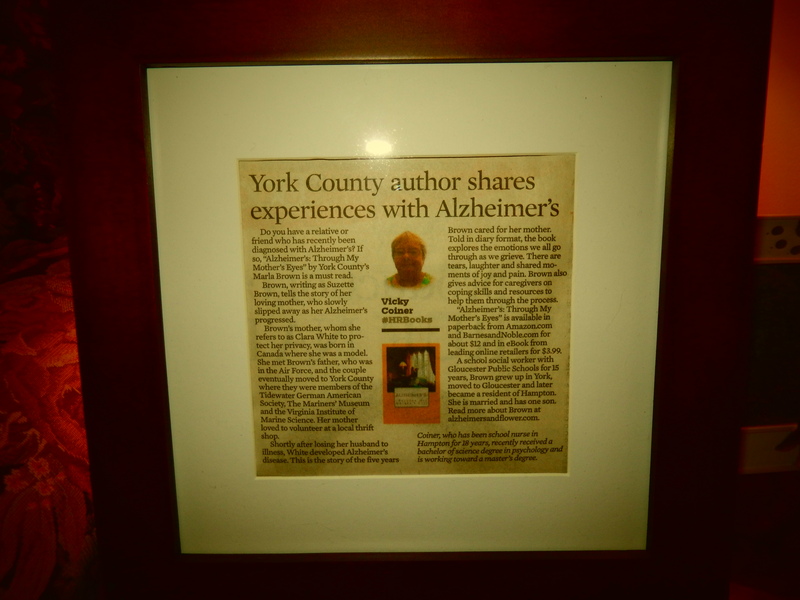 My Book Review from “The Daily Press” newspaper – “York County author shares experiences with Alzheimer’s” | "Alzheimer's: Through My Mothers Eyes"
My “feature” as a “local author” in The Daily Press Newspaper was given to me as a Christmas present – framed and ready to hang ! So proud of it ! Posted in Uncategorized and tagged #alzforum #alzchat, #Alzheimers, #Alzheimers #caregiving #caregiver #caregivers #author, #author, #caregiver, #caregiving, #family, #Indie, Alzheimer, Alzheimers chat, assisted living, assisted living facility, Blog, Blurb, book, book interview, book review, care, Caregivers, Dementia, disease. Bookmark the permalink. Pingback: My Book Review from “The Daily Press” newspaper – “York County author shares experiences with Alzheimer’s” | "Alzheimer's: Through My Mothers Eyes"